Despite the storm call and the blown out rivers, I just had to wet my line and I couldn't wait for the water to clear or blow out again. 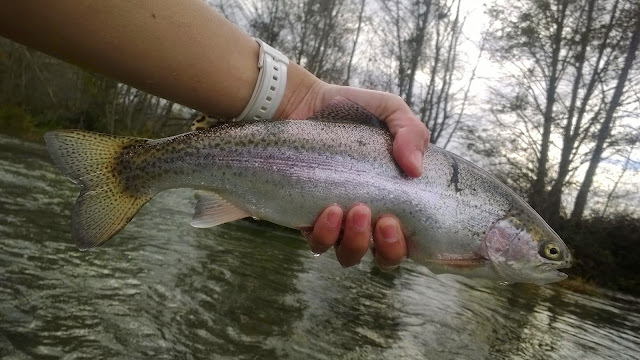 I took a morning trip to the Feather and was able to hook a nice half-pounder on an egg pattern that was swung. The water clarity was about a foot and the flows were just slightly above average, still wadeable and kinda not really clear. Most of the salmon are gone and with these flows the fish are either up near the hatchery or just trickling in. It was a tough day with the bad water clarity so I didn't stay very long. I'm planning a weekend trip to the Trinity with my brother. I'm hoping it isn't too blownout so we can actually fish it. Really crossing my fingers on this one.